Life is challenging and how we react to this is what decides our happiness. We can give up or we can move forward. For many years I gave up. I barely tried and ended up wallowing in pain and depression that lasted way too long. Luckily I woke up and realized that my life was in my control. I taught myself to be happy by learning my own truth, trusting my struggle and staying focused on creating a life that I would enjoy. 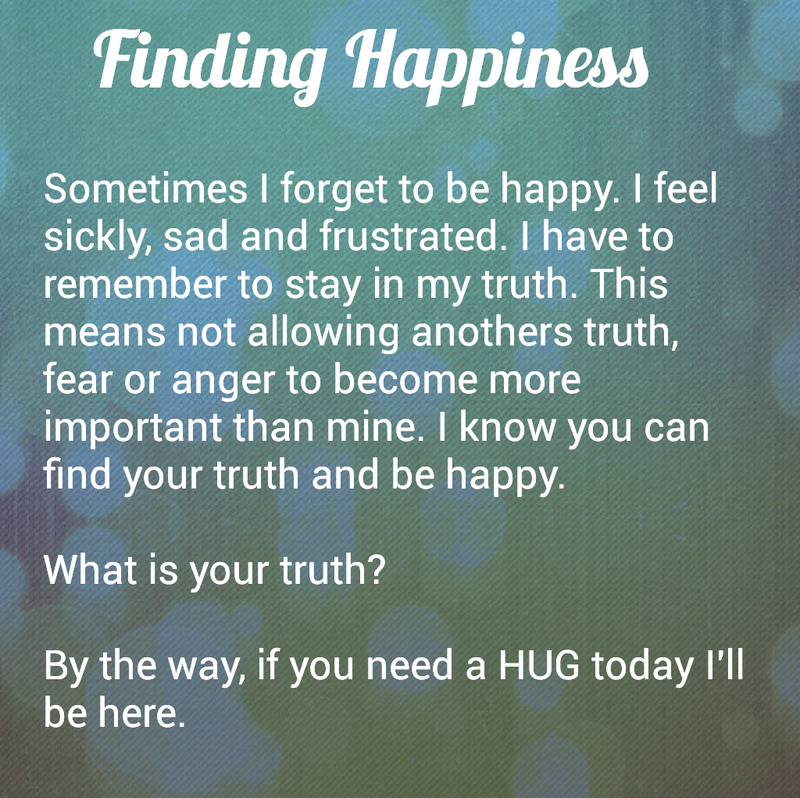 How did I find my truth? By asking myself questions and then taking action. What makes me happy in the long run as opposed to instant gratification? What are my true passions? Am I willing to move forward beyond my fear and live a life that resonates as true happiness with my inner self? Once I began to answer these questions I began to take action. I started writing, published books, became a self-defense instructor, read every self-help book I could find and asked for help. It wasn’t easy. Some days are hard and I forget my truth, but I always come back. I know that you can do this too. You just have to make the choice to find your truth and LIVE IT! An important aspect of staying happy is to find things and activities that make you feel good AND are also good for you. You probably won’t find happiness at the bottom of a tequila bottle or immersing yourself in angry depression movies, books and music. When I was in the process of healing I gave up those things for more positive entertainment. If you also choose positive reinforcement throughout your daily life, you’ll see a change in your thoughts which will in turn change your feelings. When I’m feeling mentally strung out I really like HUGS, positive affirmations and time with people who love me without judgement. To keep my physical body feeling good I gave up the daily sodas and twinkies and instea choose flavorful healthy foods and lots of movement. Yoga, swimming, paddbleboarding and walking really keep my energy up and on par with my positive mental state. Remember there will be days and moments when you won’t be happy. That’s okay. You’re an imperfectly perfect being. Embrace that reality and RELEASE the expectation to always be bright and cheerful. Previous postHappy Women’s Equality Day! JUST KIDDING! – We’ve STILL Got Action to Take! Thanks for sharing this inspirational article. I remember when I was going through abuse in one of my relationships. I found comfort in drinking brandy, eating chocolate and smoking. That wasn’t the answer. I found my truth when I became single. I went to university, qualified as a teacher, started writing again, created my blogs and became a freelance copywriter. I also found God. Now I’m content, even though I’m single. I’m in a good place. I’m happy you enjoyed my article and proud of you for leaving the abuse. From my previous work I know that is NOT easy. It is FASCINATING what we will put up with in the name of love or in my case wanting to be acceppted by others.